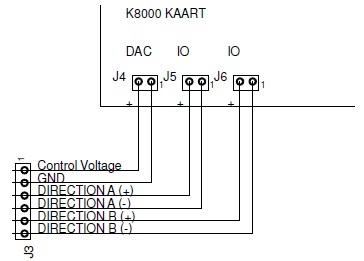 The K8000 has some analog outputs (DAC channels) that can be set to any value between 0 and 10 VDC. These outputs can't provide much current as the output voltage drops as soon as the load becomes too high. I started designing some kind of amplifying circuit that can deliver higher currents: the output voltage can be controlled from 0 to 10 V with a current of up to 9 A. 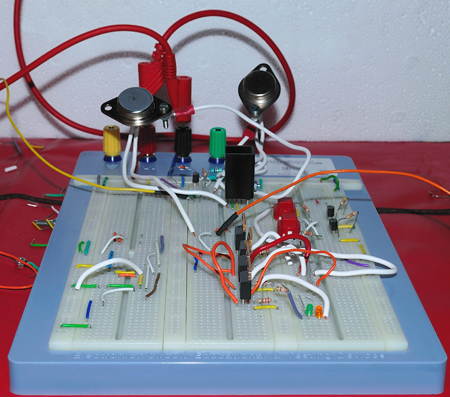 The circuit also has an option to toggle the output polarity: it can be used as current reverser for a DC motor. Using the circuit is easy. It has a power connector you need to connect an AC voltage to (preferable 15 V). A second connector is the output: you can connect the load to this connector. The third connector is the most important one: the control connector. It accepts the control voltage: the voltage coming from the DAC output port of the K8000. It also has 4 extra connections: 2 for each direction (DIRECTION A and DIRECTION B). You can activate a certain connection by connecting the 2 connectors for a certain direction. As this is a larger project I have split the complete description into multiple webpages.